Not to be confused with the Syria-based Popular Front for the Liberation of Palestine – General Command. The Popular Front for the Liberation of Palestine (PFLP) (Arabic: الجبهة الشعبية لتحرير فلسطين, al-Jabhah al-Sha`biyyah li-Taḥrīr Filasṭīn) is a secular Palestinian Marxist–Leninist and revolutionary socialist organization founded in 1967 by George Habash. It has consistently been the second-largest of the groups forming the Palestine Liberation Organization (the PLO, founded in 1964), the largest being Fatah (founded in 1959). As of 2015[update] the PFLP boycotts participation in the PLO Executive Committee and the Palestinian National Council. Ahmad Sa'adat has served as Secretary-General of the PFLP since 2001. He was sentenced in December 2006 to 30 years in an Israeli prison. The PFLP currently considers both the Fatah-led government in the West Bank and the Hamas government in the Gaza Strip illegal because elections to the Palestinian National Authority have not been held since 2006. The United States, Japan, Canada, Australia, and the European Union have designated the PFLP as a terrorist organization. From its foundation the PFLP sought both superpower and regional patrons and early developed ties with the People's Republic of China, the Soviet Union and, at various times, with regional powers such as Syria, South Yemen, Libya and Iraq, as well as with left-wing groups around the world, including the PKK, FARC and the Japanese Red Army. When that support diminished or stopped, in the late 1980s and 1990s, the PFLP sought new allies and developed contacts with Islamist groups linked to Iran, despite the PFLP's strong adherence to secularism and anti-clericalism. The relationship between the PFLP and the Islamic Republic of Iran has fluctuated – it strengthened as a result of Hamas moving away from Iran due to differing positions on the Syrian Civil War. Iran rewarded the PFLP for its pro-Assad stance with an increase in financial and military assistance. The PFLP has generally taken a hard line on Palestinian national aspirations, opposing the more moderate stance of Fatah. It does not recognise the State of Israel, it opposes negotiations with the Israeli government, and favours a one-state solution to the Israeli–Palestinian conflict. The military wing of the PFLP is called the Abu Ali Mustapha Brigades. The PFLP is well known for pioneering armed aircraft-hijackings in the late 1960s and early 1970s. According to PFLP Politburo member and former aircraft-hijacker Leila Khaled, the PFLP does not see suicide bombing as a form of resistance to occupation or as a strategic action or policy and no longer carries out such attacks. The PFLP grew out of the Harakat al-Qawmiyyin al-Arab, or Arab Nationalist Movement (ANM), founded in 1953 by George Habash, a Palestinian Christian, from Lydda. In 1948, 19-year-old Habash, a medical student, went to his home town of Lydda during the 1948 Arab–Israeli War to help his family. While he was there, the Israel Defense Forces attacked the city and as a result most of its civilian population was forced to leave. They marched for three days without food or water until they reached the Arab armies' front lines. Habash finished his medical education in Lebanon at the American University in Beirut, graduating in 1951. In an interview with US journalist John K. Cooley, Habash identified the Arab defeat by the Zionists as "the scientific society of Israel as against our own backwardness in the Arab world. This called for the total rebuilding of Arab society into a twentieth-century society." The ANM was founded in this nationalist spirit. "[We] held the 'Guevara view' of the 'revolutionary human being'," Habash told Cooley. "A new breed of man had to emerge, among the Arabs as everywhere else. This meant applying everything in human power to the realization of a cause." The ANM formed underground branches in several Arab countries, including Libya, Saudi Arabia and Kuwait, then still under British rule. It adopted secularism and socialist economic ideas, and pushed for armed struggle. In collaboration with the Palestinian Liberation Army, the ANM established Abtal al-Audah (Heroes of the Return) as a commando group in 1966. 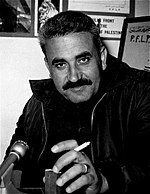 After the Six-Day War of June 1967, ANM merged in August with two other groups, Youth for Revenge and Ahmed Jibril's Syrian-backed Palestine Liberation Front, to form the PFLP, with Habash as leader. By early 1968, the PFLP had trained between one and three thousand guerrillas. It had the financial backing of Syria, and was headquartered there, and one of its training camps was based in as-Salt, Jordan. In 1969, the PFLP declared itself a Marxist–Leninist organization, but it has remained faithful to Pan Arabism, seeing the Palestinian struggle as part of a wider uprising against Western imperialism, which also aims to unite the Arab world by overthrowing "reactionary" regimes. It published a newspaper, al-Hadaf (The Target, or Goal), which was edited by Ghassan Kanafani. The PFLP gained notoriety in the late 1960s and early 1970s for a series of armed attacks and aircraft hijackings, including on non-Israeli targets. Their Abu Ali Mustapha Brigades also claimed responsibility for several suicide attacks during the Al-Aqsa Intifada. See #Armed attacks of the PFLP below. In 1967, Palestinian Popular Struggle Front (PPSF) broke away from the PFLP. In 1968, Ahmed Jibril broke away from the PFLP to form the Syrian-backed Popular Front for the Liberation of Palestine – General Command (PFLP-GC). 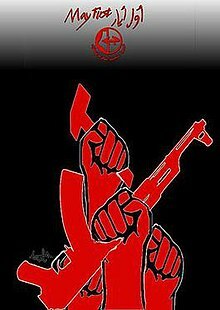 In 1969, the Democratic Front for the Liberation of Palestine (DFLP) formed as a separate, ostensibly Maoist, organization under Nayef Hawatmeh and Yasser Abd Rabbo, initially as the PDFLP. In 1972, the Popular Revolutionary Front for the Liberation of Palestine was formed following a split in PFLP. The PFLP had a troubled relationship with George Habash's one-time deputy, Wadie Haddad, who was eventually expelled because he refused orders to stop attacks and kidnapping operations abroad. Haddad has been identified in released Soviet archival documents as having been a KGB intelligence agent in place, who in 1975 received arms for the movement directly from Soviet sources in a nighttime transfer in the Sea of Aden. The PFLP joined the Palestine Liberation Organization (PLO), the umbrella organization of the Palestinian national movement, in 1968, becoming the second-largest faction after Yassir Arafat's Fatah. In 1974, it withdrew from the organization's executive committee (but not from the PLO) to join the Rejectionist Front following the creation of the PLO's Ten Point Program, accusing the PLO of abandoning the goal of destroying Israel outright in favor of a binational solution, which was opposed by the PFLP leadership. It rejoined the executive committee in 1981. Currently, the PFLP is boycotting participation in the PLO Executive Committee and the Palestinian National Council. After the eruption of the First Intifada and the subsequent Oslo Accords the PFLP had difficulty establishing itself in the West Bank and Gaza Strip. At that time (1993–96) Hamas enjoyed rapidly rising popularity in the wake of their successful strategy of suicide bombings devised by Yahya Ayyash ("the Engineer"). The fall of the Soviet Union together with the rise of Islamism—and particularly the increased popularity of the Islamist groups Hamas and Palestinian Islamic Jihad—disoriented many left activists who had looked towards the Soviet Union, and has marginalised the PFLP's role in Palestinian politics and armed resistance. However, the organization retains considerable political influence within the PLO, since no new elections have been held for the organisation's legislative body, the PNC. The PFLP developed contacts at this time with Islamic fundamentalist groups linked to Iran – both Palestinian Hamas, and the Lebanon-based Hizbullah – a detour from its avowedly Marxist orientation. The PLO's agreement with Israel in September 1993, and negotiations which followed, further isolated it from the umbrella organization and led it to conclude a formal alliance with the Iranian backed groups. As a result of its post-Oslo weakness, the PFLP has been forced to adapt slowly and find partners among politically active, preferably young, Palestinians in the West Bank and Gaza, in order to compensate for their dependence on their aging commanders returning from or remaining in exile. The PFLP has therefore formed alliances with other leftist groups formed within the Palestinian Authority, including the Palestinian People's Party and the Popular Resistance Committees of Gaza. In 1990, the PFLP transformed its Jordan branch into a separate political party, the Jordanian Popular Democratic Unity Party. Following the death of Yasser Arafat in November 2004, the PFLP entered discussions with the DFLP and the Palestinian People's Party aimed at nominating a joint left-wing candidate for the Palestinian presidential election to be held on 9 January 2005. These discussions were unsuccessful, so the PFLP decided to support the independent Palestinian National Initiative's candidate Mustafa Barghouti, who gained 19.48% of the vote. In the municipal elections of December 2005 it had more success, e.g. in al-Bireh and Ramallah, and winning the mayorship of Bir Zeit. There are conflicting reports about the political allegiance of Janet Mikhail and Victor Batarseh, the mayors of Ramallah and Bethlehem, they may be close to the PFLP without being members. The PFLP is powerful politically in the Ramallah area, the eastern districts and suburbs of Jerusalem and Bethlehem, the primarily Christian Refidyeh district of Nablus, but has far less strength in the rest of the West Bank, and is of little or no threat to the established Hamas and Fatah movements in Gaza. The PFLP participated in the Palestinian legislative elections of 2006 as the "Martyr Abu Ali Mustafa List". It won 4.2% of the popular vote winning three of the 132 seats in the Palestinian Legislative Council. Its deputies are Ahmad Sa'adat, Jamil Majdalawi, and Khalida Jarrar. In the lists, its best vote was 9.4% in Bethlehem, followed by 6.6% in Ramallah and al-Bireh, and 6.5% in North Gaza. Sa'adat was sentenced in December 2006 to 30 years in an Israeli prison. At the PFLP's Sixth National Conference in 2000, Habash stepped down as General Secretary. Abu Ali Mustafa was elected to replace him, but was assassinated on 27 August 2001 when an Israeli helicopter fired rockets at his office in the West Bank town of Ramallah. After Mustafa's death, the Central Committee of the PFLP on 3 October 2001 elected Ahmad Sa'adat General Secretary. He has held that position, though since 2002 he has been incarcerated in Palestinian and Israeli prisons. When it was formed in the late 1960s the PFLP supported the established line of most Palestinian guerrilla fronts and ruled out any negotiated settlement with Israel that would result in two states between the Jordan River and the Mediterranean Sea. Instead, George Habash in particular, and various other leaders in general advocated one state with an Arab identity in which Jews were entitled to live with the same rights as any minority. The PFLP declared that its goal was to "create a people's democratic Palestine, where Arabs and Jews would live without discrimination, a state without classes and national oppression, a state which allows Arabs and Jews to develop their national culture." The PFLP platform never wavered on key points such as the overthrow of conservative or monarchist Arab states like Morocco and Jordan, the Right of Return of all Palestinian refugees to their homes in pre-1948 Palestine, or the use of the liberation of Palestine as a launching board for achieving Arab unity – reflecting its beginnings in the Pan-Arab ANM. It opposed the Oslo Accords and was for a long time opposed to the idea of a two-state solution to the Israeli–Palestinian conflict, but in 1999 came to an agreement with the PLO leadership regarding negotiations with the Israeli government. However, in May 2010, PFLP general secretary Ahmad Sa'adat called for an end to the PLO's negotiations with Israel, saying that only a one-state solution was possible. The PFLP opposed the 2007 conflict between Hamas and Fatah and believes that the Salam Fayyad government is not helpful in solving the conflict. In January 2011, the PFLP declared that the Camp David Accords stood for "subservience, submission, dictatorship and silence", and called for social and political revolution in Egypt. In December 2013, the PFLP stated: "Hamas is a vital part of the Palestinian national movement, and this is the position of the PFLP." The PFLP's armed wing, in the West Bank and Gaza, the Abu Ali Mustapha Brigades, draws much of its support from student organizations in universities like Al-Quds University (eastern Jerusalem), Bir Zeit University (Ramallah area), An-Najah National University (Nablus), and the Arab American University. The movement has thousands of active or passive activists in the West Bank, and a few hundred behind bars in Israeli prisons. In December 2009, around 70,000 supporters demonstrated in Gaza to celebrate the PFLP's 42nd anniversary. The PFLP's leader in Gaza is Rabah Muhanna. This is a list of armed attacks attributed to the PFLP. It is not complete. An attack on El Al Flight 432 passengers jet at Zürich airport on 18 February 1969, killing the co-pilot and wounding the pilot; an Israeli undercover agent thwarted the hijacking after killing the terrorist leader. Bombings by Rasmea Odeh and other PFLP members killed 21-year-old Leon Kanner of Netanya and 22-year-old Eddie Joffe on 21 February 1969. The two were killed by a bomb placed in a crowded Jerusalem SuperSol supermarket which the two students stopped in at to buy groceries for a field trip. The same bomb wounded 9 others. A second bomb was found at the supermarket, and defused. Odeh was also convicted of bombing and damaging the British Consulate four days later. In 1980, Odeh was among 78 prisoners released by Israel in an exchange with the PFLP for one Israeli soldier captured in Lebanon. On 6 September 1970, the PFLP, including Leila Khaled, hijacked four passenger aircraft from Pan Am, TWA and Swissair on flights to New York from Brussels, Frankfurt and Zürich, and failed in an attempt to hijack an El Al aircraft which landed safely in London after one hijacker was killed and the other overpowered; and on 9 September 1970, hijacked a BOAC flight from Bahrain to London via Beirut. The Pan Am flight was diverted to Cairo; the TWA, Swissair and BOAC flights were diverted to Dawson's Field in Zarqa, Jordan. The TWA, Swissair and BOAC aircraft were subsequently blown up by the PFLP on 12 September, in front of the world media, after all passengers had been taken off the planes. The event is significant, as it was cited as a reason for the Black September clashes between Palestinian and Jordanian forces. On 30 May 1972, 28 passengers were gunned down at Ben Gurion International Airport by members of the Japanese Red Army in collaboration with the PFLP's Waddie Haddad in what became known as the Lod Airport massacre. Haddad had been ordered to stop planning operations, and ordered the attack without the PFLP's knowledge. On 13 October 1977, the PFLP hijacked Lufthansa Flight 181, a Boeing 737 flying from Palma de Mallorca to Frankfurt. After various stopovers the pilot was killed. The remaining passengers and crew were eventually rescued by German counter-terrorism special forces see Mogadishu hijacking. On 12 April 1984 a bus from Tel Aviv was hijacked. Bassam Abu Sharif in Damascus issued a statement in the name of the PFLP claiming responsibility. The killing of Meir Lixenberg, councillor and head of security in four settlements, who was shot while travelling in his car in the West Bank on 27 August 2001. PFLP claimed that this was a retaliation for the killing of Abu Ali Mustafa. 21 October 2001 assassination of Israeli Minister for Tourism Rehavam Zeevi by Hamdi Quran. A suicide bombing in a pizzeria in Karnei Shomron, on the West Bank on 16 February 2002, killing three Israeli teenagers. A suicide bombing in Ariel on 7 March 2002, which left wounded but no fatalities. A suicide bombing in a Netanya market in Israel, on 19 May 2002, killing three Israelis. This attack was also claimed by Hamas, but the Abu Ali Mustafa Brigades have identified the perpetrator on their website as one of their members. A suicide bombing in the bus station at Geha Junction in Petah Tikva on 25 December 2003 which killed 4 Israelis. A suicide bombing in the Jordan Rift Valley on 22 May 2004, which left no fatalities. A suicide bombing in the Carmel Market in Tel Aviv on 1 November 2004, which killed 3 Israeli civilians. 14 April 2009, PFLP militants fire a homemade projectile at the Kerem Shalom border crossing, HaDarom. 23 October 2012, A PFLP roadside bomb detonated targeting an Israel Defense Forces (IDF) patrol near Kibbutz Kissufim, Southern, Israel. An IDF commander was seriously injured in the blast. 10 November 2012, PFLP militants fired an anti-tank missile towards Karni Crossing near the Gaza Strip, near Nahal Oz. The explosive device struck an Israeli Givati Brigade jeep, injuring four soldiers and destroying the vehicle. 18 November 2014, some sources stated that the PFLP took responsibility for the 2014 Jerusalem synagogue massacre in which four Jewish worshipers and a policeman were killed with axes, knives, and a gun, while seven were injured.The Israeli police concluded it was a lone wolf operation. 29 June 2015, the PFLP claimed responsibility for an attack in which Palestinians passed by an Israeli car with a vehicle and shot it. 4 people were injured, one was severely injured and died the next day in hospital. ^ "Jerusalem Synagogue Attack: Motivation Was Not Religion But Revenge For 1948 Massacre, Says PFLP". International Business Times. 19 November 2014. ^ "Popular Front for the Liberation of Palestine (1) Archived 17 October 2011 at the Wayback Machine." Terrorist Group Symbols Database. Anti-Defamation League. ^ "Platform of the Popular Front for the Liberation of Palestine (PFLP)" (1969). From Walter Laqueur and Barry Rubin, eds., The Israel-Arab Reader (New York: Penguin Books, 2001). ^ "Popular Front for the Liberation of Palestine (PFLP)". www.jewishvirtuallibrary.org. Retrieved 27 March 2018. ^ a b "Jailed PFLP leader: Only a one-state solution is possible". Haaretz. 29 April 2012. Retrieved 8 May 2012. ^ a b Ibrahim, Arwa (13 February 2015). "PROFILE: The Popular Front for the Liberation of Palestine". Middle East Eye. ^ "Bringing the PFLP back into PLO fold?". Ma'an News Agency. 2 October 2010. ^ "Profile: Popular Front for the Liberation of Palestine (PFLP)". BBC News. 18 November 2014. ^ a b Sawafta, Ali. "Palestinian forum convenes after 22 years, beset by division". reuters.com. ^ "Fatah slams Hamas' intention to reshuffle its deposed government". People's Daily Online. 26 December 2010. Retrieved 4 February 2012. ^ "Foreign Terrorist Organizations". U.S. Department of State. ^ "About the listing process". Retrieved 17 July 2015. ^ "Israeli legal group threatens to sue Australian charity for funding terror group". Times of Israel. 14 October 2012. Retrieved 23 March 2016. ^ "Iran Increases Aid to PFLP Thanks to Syria Stance". Al-Monitor. Retrieved 17 July 2015. ^ "Popular Front for the Liberation of Palestine". BBC News. 26 January 2008. Retrieved 4 February 2012. ^ a b Cooley, John K. (1973). Green March Black September: The Story of the Palestinian Arabs. London: Frank Cass & Co,. Ltd. p. 135. ISBN 0-7146-2987-1. ^ Nassar Ibrahim (22 December 2005). "Palestinian Municipal Elections: The Left is advancing, while Hamas capitalizes on the decline of Fatah". Alternatives International. Retrieved 4 February 2012. ^ "PFLP salutes the Egyptian people and their struggle". Popular Front for the Liberation of Palestine (PFLP). 27 January 2011. Retrieved 4 February 2012. ^ "PFLP: Hamas is part of the Palestinian national movement and we do not call upon them to abandon their ideology". Popular Front for the Liberation of Palestine (PFLP). 30 December 2013. Retrieved 3 January 2013. ^ "Revolutionary roses". Al Ahram. 17 March 2010. Archived from the original on 24 January 2012. Retrieved 8 May 2012. ^ "Popular Front for the Liberation of Palestine". PFLP. Retrieved 8 May 2012. ^ a b Michael Tarm (24 October 2013). "Rasmieh Yousef Odeh, Community Activist, Accused Of Hiding Terror Conviction To Gain Citizenship". The Huffington Post. ^ a b "Jerusalem Supersol Re-opens for Business; 2 Young Bombing Victims Are Buried". Jewish Telegraphic Agency. 24 February 1969. ^ "Arab-American activist on trial for allegedly concealing terror role in immigration papers". The Guardian. 5 November 2014. ^ a b "Trial set for Jerusalem terror convict who moved to US". The Times of Israel. 3 September 2014. ^ a b "Palestinian convicted of two bombings back in U.S. court over immigration fraud". Haaretz. 2 September 2014. ^ Barbara Hollingsworth (30 October 2014). "Convicted Terrorist Goes on Trial in Detroit for Immigration Fraud". CNS. ^ Jillian Kay Melchior (26 February 2014). "Convicted Terrorist Worked as Obamacare Navigator in Illinois". National Review Online. ^ "Trial set for U.S.-Palestinian immigrant convicted in Israel deaths; Rasmieh Odeh is accused of hiding she was convicted in Israel for terror attacks from American immigration officials". Haaretz. 3 October 2014. ^ Lorraine Swanson (21 October 2014). "Evergreen Park Woman Accused of Hiding Terrorist Past". Evergreen Park, Illinois Patch. ^ "Evergreen Park woman Rasmieh Odeh charged with lying about Palestinian terrorist past". ABC13 Houston. 23 October 2013. ^ Jason Meisner (22 October 2013). "Feds: Woman hid terror conviction to get citizenship". Chicago Tribune. ^ The Times' (London), 14 April 1984. Robert Fisk. ^ "ITAMAR- Meir Lixenberg". Shechem. 31 August 2001. Archived from the original on 14 April 2012. Retrieved 8 May 2012. ^ a b c "Middle East: Israel and the Occupied Territories and the Palestinian Authority: Without distinction – attacks on civilians by Palestinian armed groups". Amnesty International (Index Number: MDE 02/003/2002). 10 July 2002. Retrieved 4 February 2012. ^ "ynet ארבעה הרוגים בפיגוע בצומת גהה – חדשות". Ynet. 20 June 1995. Retrieved 8 May 2012. ^ "מחבל פוצץ עצמו במחסום בבקעה, חייל נפצע קל – חדשות". Ynet. 20 June 1995. Retrieved 8 May 2012. ^ "2 נשים וגבר נרצחו בפיגוע בשוק הכרמל בת"א – חדשות". Ynet. 20 June 1995. Retrieved 8 May 2012. ^ "Incident Summary for GTDID: 200804140017". start.umd.edu. ^ "Incident Summary for GTDID: 201210230007". ^ "Incident Summary for GTDID: 201211100023". start.umd.edu. ^ "Jerusalem synagogue attack: Popular Front for Liberation of Palestine claims responsibility". The Independent. ^ "Jerusalem synagogue axe attack kills five". Telegraph. 18 November 2014. ^ Chaim Levinson and Gili Cohen (30 June 2015). "Four wounded, one seriously, in West Bank shooting attack". Haaretz. Retrieved 17 July 2015. ^ "Israeli man wounded in West Bank terror shooting dies in Jerusalem hospital". The Jerusalem Post. Retrieved 17 July 2015.